Inducible. Next generation sequencing technologies have the tremendous potential to identify disease-causing genes in a hypothesis-free manner. In a recent publication in the American Journal of Human Genetics, mutations in the gene for the salt-inducible kinase 1 (SIK1) are found in patients with early onset epileptic encephalopathy. In addition to a previously unknown functional network related to intracellular salt in the CNS, the authors demonstrate a peculiar mutational mechanism – activating truncation mutations. Figure. SIK1 is implicated in relaying signals from the various sources converging on protein kinase A to to transcriptional regulators such as HDACs. The role of SIK1 in the human brain is not well understood, but Hansen and collaborators demonstrate convincingly that truncating de novo mutations in this gene lead to severe epileptic encephalopathies. Salt and seizures. Let me be upfront and tell you that I chose this publication because of a flashback that I had when I read the abstract of the recent publication by Hansen and collaborators. I was reminded of the first child with status epilepticus that I was involved in – a three month old girl who had a prolonged and difficult to treat seizure because of salt. In the setting of a viral infection, her sodium had dropped to 122 and she had status epilepticus because of this. As her sodium levels could be reverted to normal values quickly, she recovered quickly. 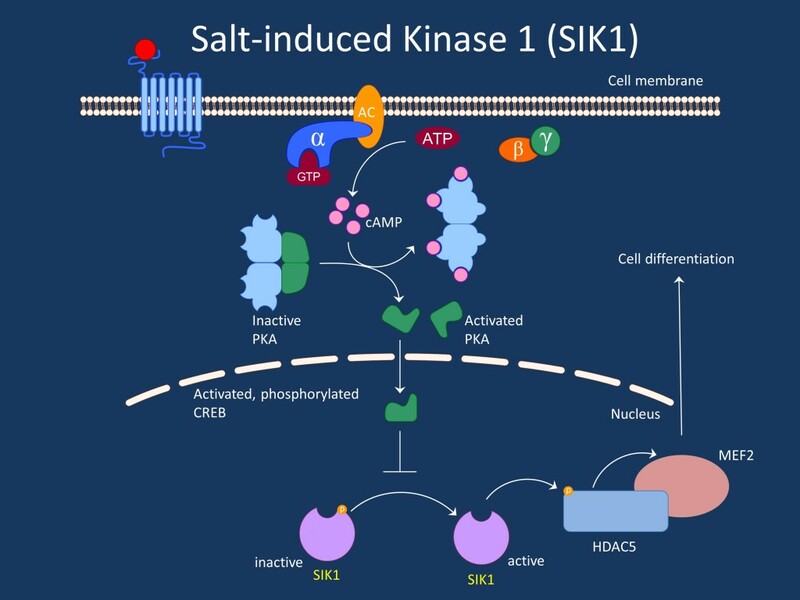 Hansen and collaborators describe de novo mutations in the gene for the salt-induced kinase 1 (SIK1) in patients with severe epileptic encephalopathy, an intracellular protein that is involved in sensing the sodium chloride concentration in cells. However, my analogy is pure speculation at this point, trying to fill the knowledge gap with respect to the role SIK1 in the Central Nervous System, an aspect of SIK1 function that is not well understood. Here is what we know. Downstream effect. The SIK1 protein is integrated in a complex functional network that relays signalling through protein kinase A to various targets. Histone deacetylase 5 (HDAC5) is one of the best researched targets for SIK1 action. HDACs remove acetyl groups from histone, the spools around which DNA is wound. This removal eventually leads to increased spooling and repression of transcription. For HDAC5, the association with the muscle transcription factor MEF2C is well studied, which is involved in muscle development. MEF2C haploinsufficiency is also a cause of a spectrum of neurodevelopmental disorders including epileptic encephalopathy. In summary, when active, SIK1 leads to a repression of MEF2C action, which is an example on how SIK1 action can have a widespread effect on gene expression. But what are the phenotypes if a de novo mutation in SIK1 occurs? Ohtahara, EME. Based on a SIK1 mutation an index case with Early Myoclonic Epilepsy (EME) starting within the first hour of life with suppression-burst pattern on EEG, Hansen and collaborators screened a cohort of 101 patients with severe epilepsies of early life and discovered five additional patients with de novo mutations in this gene, a remarkable frequency for a single gene that suggests that SIK1 mutations may be relatively frequent in these severe epilepsies of early infancy. Two patients identified by Hansen and collaborators have Infantile Spasms. However, the other four patients have epilepsies with an earlier onset including Ohtahara Syndrome and Early Myoclonic Epilepsy. Both epileptic encephalopathies have not been systematically studied in exome sequencing studies so far. The identification of SIK1 indicates that there are patterns of genetic mutations in this cohort that can be identified. But there is more to SIK1. Hansen and collaborators stumble upon an interesting mutational mechanism. Activating de novo mutations. Taking into account the available information about SIK1, Hansen and collaborators investigated the effect on HDAC5 phosphorylation. Interestingly, even though most mutations identified by the authors were truncating mutations, they lead to an increased HDAC5 phosphorylation. The authors present some compelling data that the truncating mutations lead to decreased degradation, which in turn leads to more phosphorylation activity. All mutations occur outside the kinase domain, which attaches phophate residues to proteins. Basically, these mutations do the opposite of what you would expect from truncating mutations – they lead to more protein activity. What you need to know. De novo truncating mutation in SIK1 appear to be a recurrent cause of severe, epileptic encephalopathies with a neonatal onset. The mutational mechanism of the identified mutations is counterintuitive – rather than decreasing the over SIK1 function, the degradation of the protein is impaired, leading to an overall increase in phosphorylation, which likely leads to widespread transcriptional changes. This entry was posted in 2015, Bioinformatics, Epileptic encephalopathy and tagged CDKL5, meCP2, MEF2C, neonatal seizures, Ohtahara Syndrome, PKA, protein kinase A, salt-induced kinase, SIK1, truncating mutation, UBE3A. Bookmark the permalink.